Today is Wallis Warfield Simpson’s birthday. How lovely of her to have her birthday fall on a Friday so we could feature her cookbook. 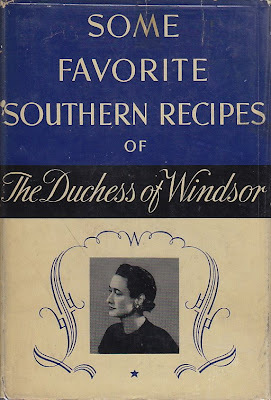 You probably didn’t know that The Duchess of Windsor, in addition to being the only woman to have a king abdicate for her, wrote a cookbook: Some Favorite Southern Recipes of the Duchess of Windsor. 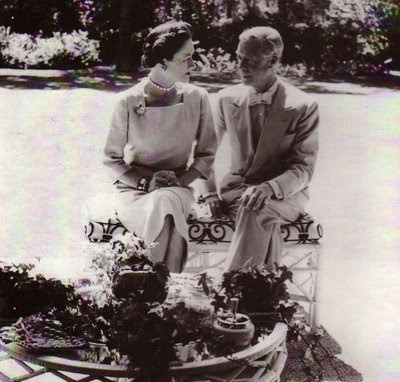 I find it hard to imagine The Duke and Duchess of Windsor prattling around their kitchen in the South of France; her making Cabbage and canned shrimp and the Duke drying the dishes! No doubt the “recipes” were handed off to their chef. Just to make sure the Duchess was no flash in the culinary pan, the Home Institute of the New York Herald Tribune tested each recipe. Poor Wallis, you make one little mistake like getting a King to give up his crown and no one trusts you! I am far more inclined to eat with the Duchess than the New York Herald Tribune. For today’s royal, though not queenly, birthday celebration, I chose a favorite cake of The Duchess of Windsor. Is it lemon chiffon cake? Devil’s food cake? A light an airy coconut cake? A rich spicy pork cake? Did you guess? Did you guess Pork Cake? Place pork in a mixing bowl and add boiling water. Add molasses, brown sugar, raisins and currants and cool. Mix and sift the flour, baking soda and spices together three times. Add to the molasses mixture and beat until smooth. Turn into long narrow bar pan (10 X 4 X 3 inches) and bake in a slow oven (325 F.) 1 hour and 15 minutes. Rarely does one find a cake recipe that begins with the 1/2 pound of fat salt pork. Pork Cakes are a Southern invention – you know in the South, when it comes to pork we eat everything but the squeal! Who knew we had such fine ideas for porky desserts. Since she was familiar with Helen Bullock’s Williamsburg recipes, one can speculate that her recipe for Pork Cake was adapted from that volume. Simultaneous post at Cookbook of the Day. I doubt the Duchess ever partook of pork cake. It may have graced her cookbook but that's the only place it graced. Or maybe it was served to Elsa Maxwell.